Our First Mystery Number Skype! 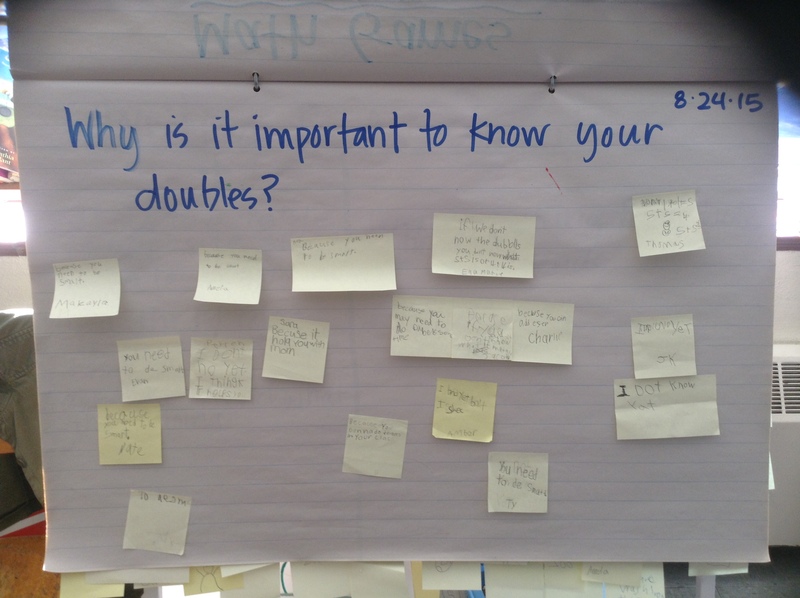 I shared our first Mystery Skype experiences with Ms. Turken’s brothers last week and how great the were. After those two great starts, I hit up my Twitter friends to find our next Skype opportunity. Instead of a location Skype, though, I had an offer for a Mystery Number Skype. We had a few practice rounds, using 2-digit numbers less than 50 (because we had agreed upon this with our Skyping friends), and then we were ready to go! Armed with 100s charts and super math questioning skills, we called our new friends, who were in Kansas. One of the things I love about doing Mystery Skypes (numbers and locations) is watching how kids step to the plate, so to speak, and try things they are unsure about. In this situation, kiddos seem to be more willing to take risks and try things that they aren’t sure is totally correct, to throw out ideas that may not work. 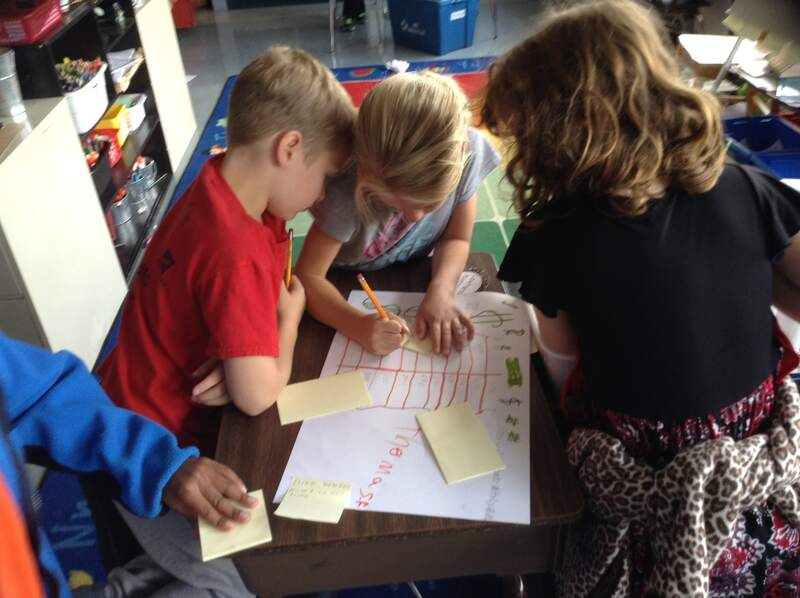 Kiddos who may not be first to speak up in class volunteer to ask questions and talk to the other class, and we meet new friends in new places that we can solve problems with–why would you NOT do Mystery Skypes all the time?? I was excited to hear kiddos use the vocabulary we had used on our practice runs, like LESS THAN, GREATER THAN, EVEN, ODD, as well as TENS and ONES. They worked hard to then mark their 100s chart to match the information they were receiving from their friends, and in the end we figured out their number was 20!! Who wants to do a Mystery Number Skype with us? We’re keen to try again, and soon we’ll be ready for a 3-digit number!! 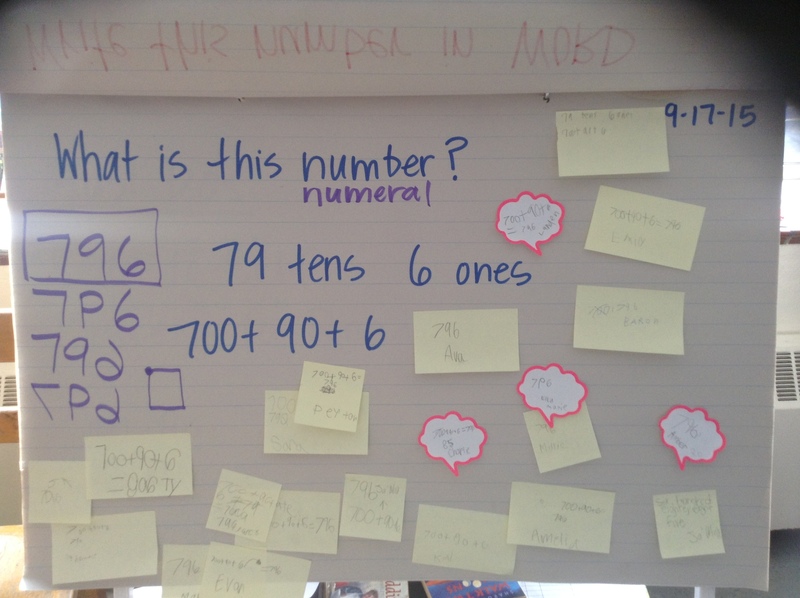 We’ve been working on a beginning counting and place value unit in math lately, and the premise behind the investigation is that we need to organize and do inventory on things in our classroom (this came after we read a story about a messy family called the Masloppys and how their son Nicholas does just that in their house so they can find things!). We’ve been counting everything in our room. And I do mean everything. If it’s not attached to the floor (or too heavy to pick up), someone has put their mathematician fingers on it! Kiddos worked in pairs to catalog a collection of classroom items (and then many more as they finished), focusing on using efficient and accurate ways to count the group. 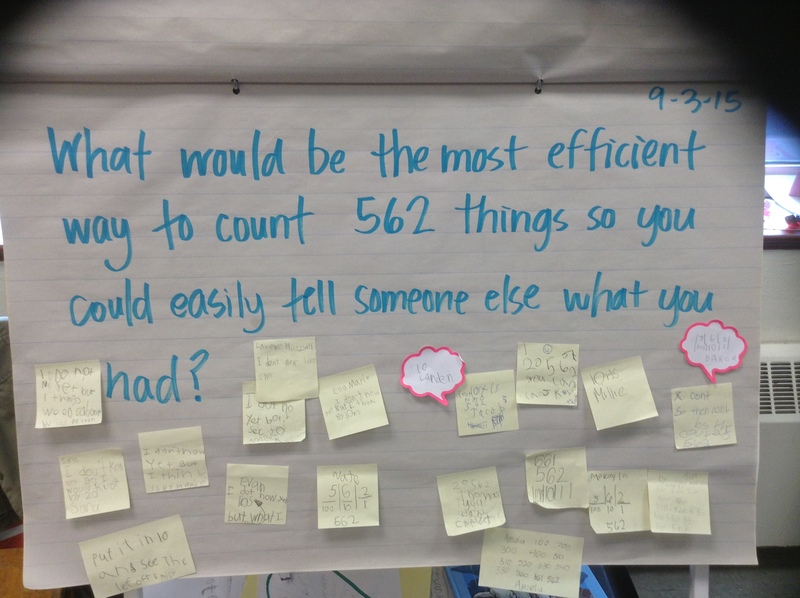 Students were charged to find a way to easily share their thinking with others; counting by groups or keeping track made it easier to tell someone else what they had done. 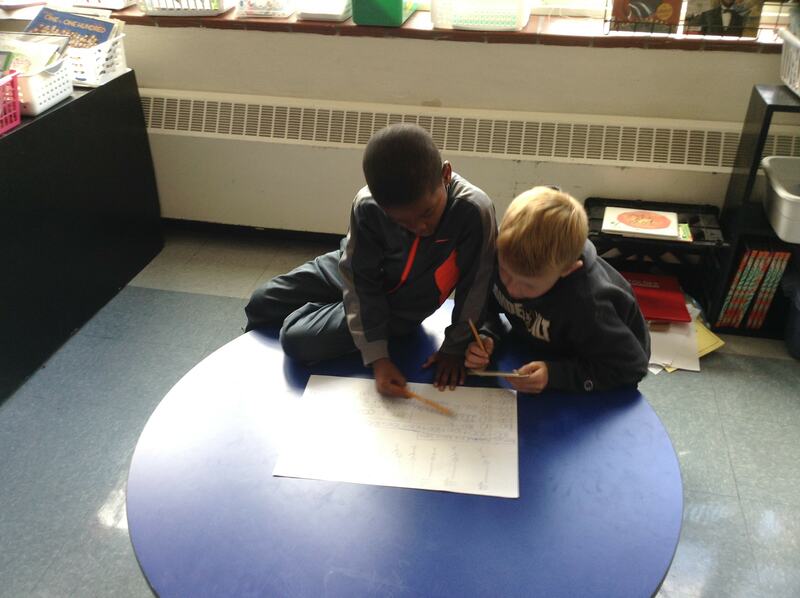 Callahan and Jesse were especially proud to share the learning they had brought with them from kindergarten (“Mr. Peacock taught us to make groups of 10!”), and they made bunches of 10 crayons into a bundle of 100! 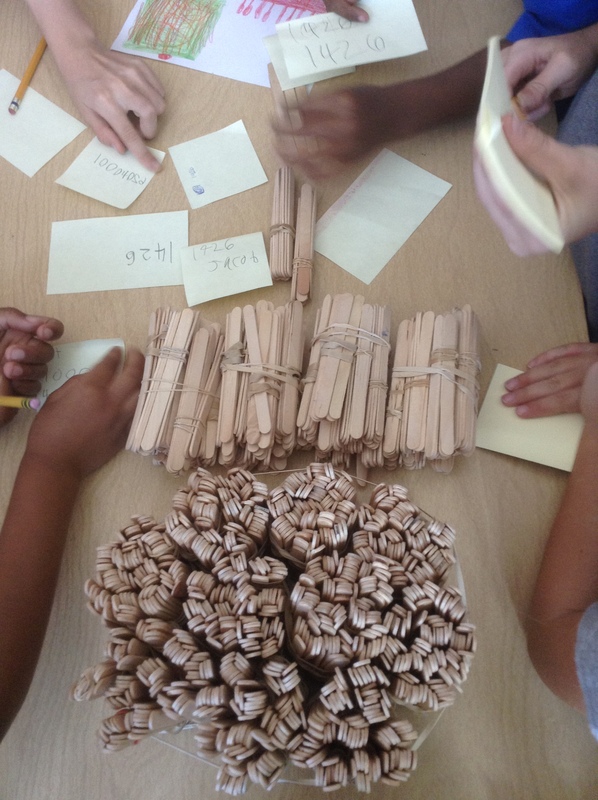 It was funny as kiddos kept running up to me asking “Can I count this?” The more they counted, too, the smarter they got at using efficient groups–notice all the rubber bands, cups and baggies in our pictures? We counted so many things we needed to record that Rachel asked for a new sheet. Love it! I have three warm-ups to share this week. We had a surprise snow day (which was a little funny because where I live there was no snow!) on Wednesday, so no warm-up that day! 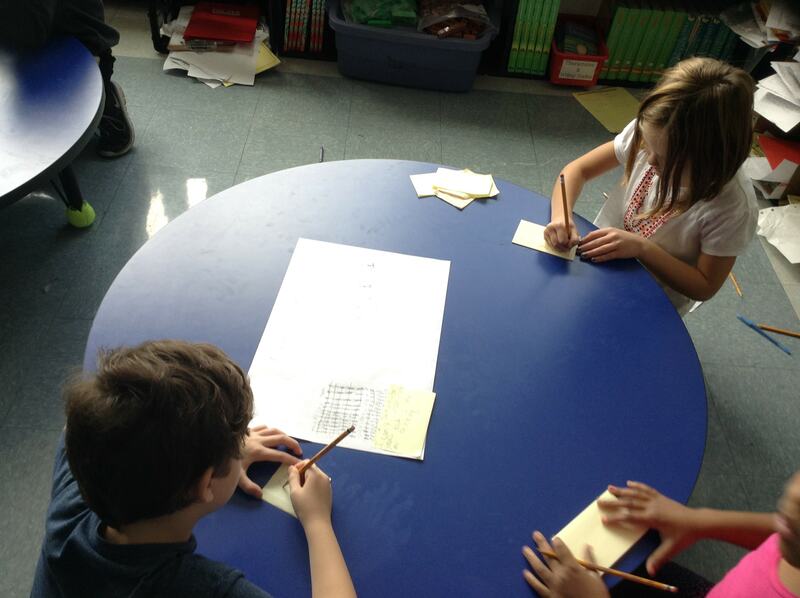 We are in the middle between our money unit and addition/subtraction up to 1000, so the problems reflect that. We modeled the solution to this one in three different ways (which we related to the ways we had done 2-digit addition earlier this year). 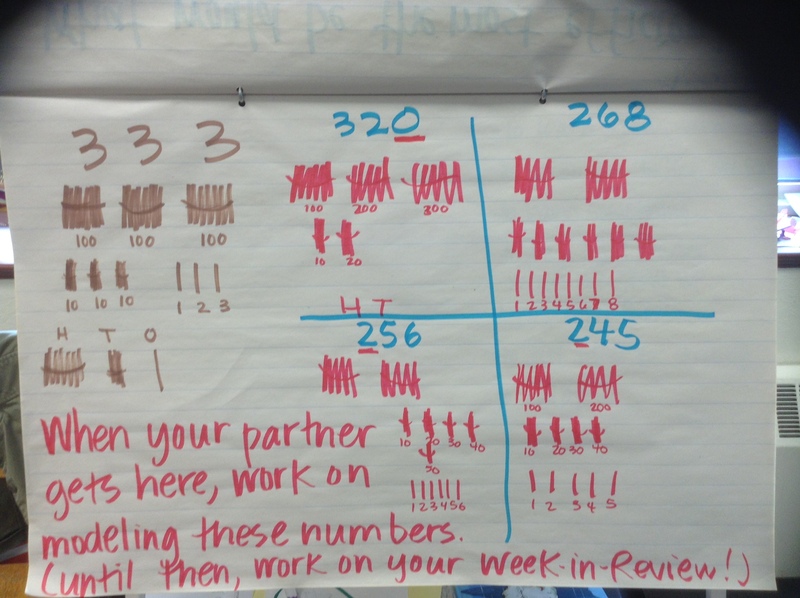 Ok, now for a confession…I was surprised when my kids made some of the connections they did this week between money and 3-digit addition. I know, right? Probably shouldn’t happen that way, but it was honestly something I hadn’t really noticed, or at least thought about it as specifically as they did. 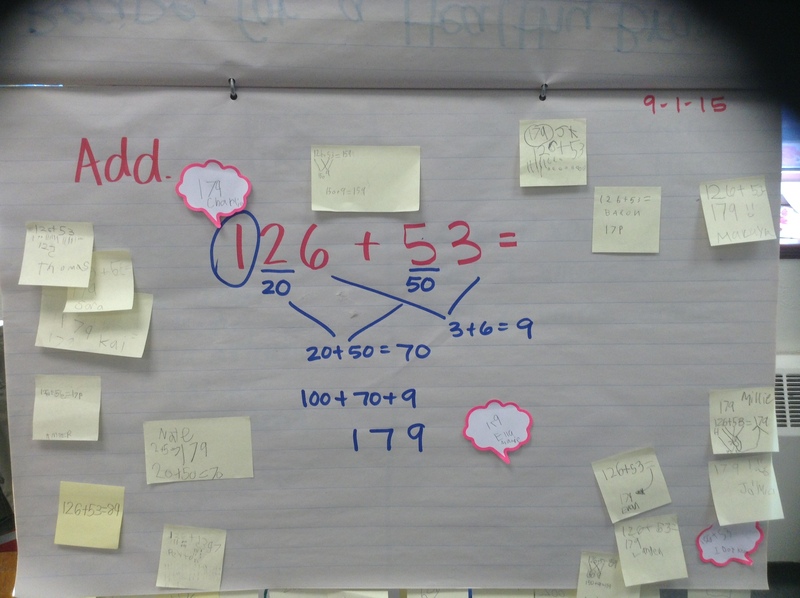 I think it was nicely pictured in the problem from Tuesday, where we solved each problem in red–they made connections between how you can add whole dollars just like the hundreds in the 2nd problem (and that’s just like 100 cents, making the amount with pennies); the tens were dimes and then the ones were pennies. Ok, so that part is not surprising to me–obviously I have this knowledge as an adult–but I honestly didn’t expect kiddos to use this to help them solve the 3-digit addition. It went even farther yesterday when I had a kiddo working on a pre-assessment for this next unit and was doing the problem 451-238. He told me he needed the money bag so he could use coins to help him. Since I always allow kiddos to use whatever manipulatives or strategies they need to figure things out I said “ok,” but I honestly was thinking this would hinder him more than help him, or that he’d end up more confused. When we first looked it he seemed confused with how he’d subtract 8 from 1 (which told me he wasn’t really solid with regrouping yet). He started by making $4.51 with half dollars, dollar coin, dimes and a penny, and seemed a little unsure about it as this point, too, asking me about names and values as he made his amount. But once he got his $4.51, he could easily take about the $2 from $2.38, as well as the $.30, which he did with 3 dimes (and I wonder if he made that $.50 that way on purpose since he could think ahead to having to break it apart later on). Then he sat with only 1 penny, and the need to subtract 8 cents. And so yes, here’s where the money came in handy–the concrete nature of being able to think about trading a dime for 10 pennies (which is what he is doing abstractly when regrouping) helped him see the constant value and how he could then actually take about the 8 pennies (8 ones) from what was there. He then counted the money he had left and told me it was $2.19. We then talked about what that would be if we were just talking about hundreds/tens/ones instead of money and by drawing it in a chart he eventually saw it as 219. I’m excited to see how this connection to money plays out for some of my friends who need to actually hold/touch/feel the addition and subtraction. 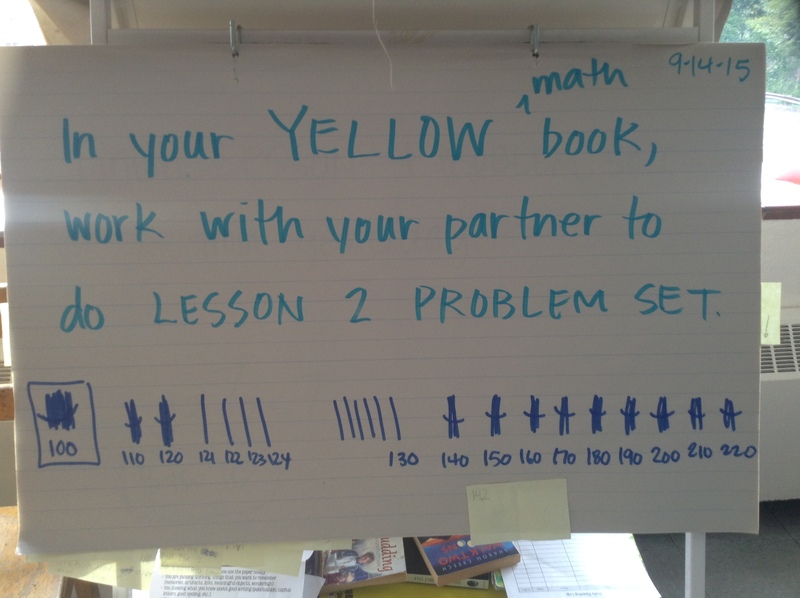 Yes, it’s something we’ve done with other kinds of math tools and strategies, but I wonder if this might even be the best connection, yet, since it’s all based on place value anyway. Oh yeah, and maybe that’s why this unit was placed after this one in the sequence…. The conversation around this problem the other day was the kind of thing that reminds me that I don’t know everything. Obviously I know this, but it’s refreshing when kiddos remind me that they are figuring out things I hadn’t thought of. I love sharing with them those moments, too. It reiterates the fact that I am not the only teacher in the room, and that I have things to learn as well as they do. And I hope it’s a lesson that all of us will remember–and use–for days to come. Yep, you read correctly. 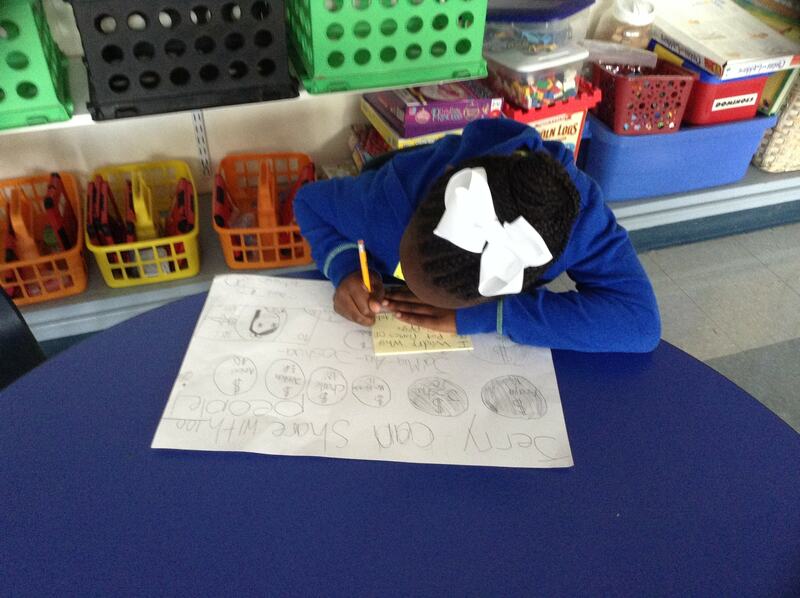 We’ve been learning the writing process–mainly in regards to our work in Writers’ Workshop–but also in math! A few years ago, when our school started working with Cathy Fosnot and Mathematics in the City, I learned about how many parallels there are between communicating in mathematics and communicating in most any other setting. At the time it was kind of mind-blowing to think about how mathematicians revise and edit their work just like authors. After hearing more, and thinking it through, and then trying it with kids, it made sense. The first unit we worked through this year was about place value, and was related in many ways to money; this made sense to kiddos and helped them think through how to “trade” 1s for 10s, 10s for 100s and just how to make groups in different ways to “make” a number. With their elbow partner they were supposed to figure our the answer to that question: If Jerry has $1000 to share, with how many people could he share a $10 bill? 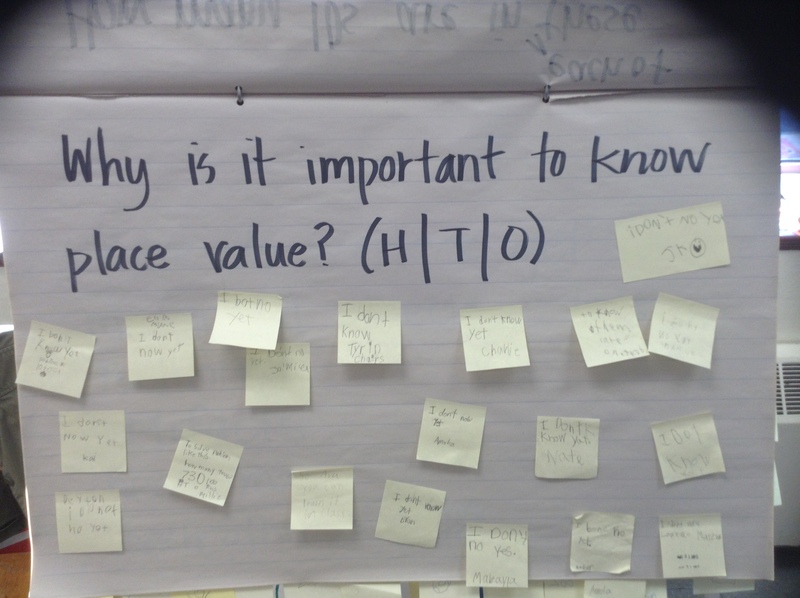 Kiddos worked for almost 2 math periods to figure out their answer (which was really the answer to the question of how many 10s are in 1000) and clearly share their thinking on a poster. For many, the answer of how many people was easy, the way to share their ideas not so much. Then we practiced recognizing helpful comments that followed the guidelines. I gave examples and non-examples, and then we modified the ones we have given a thumbs-down (which mean they were not specific, kind or math-related). After that, we were off to work in our gallery walk. We did pretty great with our first walk of the year, and I’m sure kiddos brought their kindergarten and first grade knowledge with them to help as they shared their thoughts with other groups. 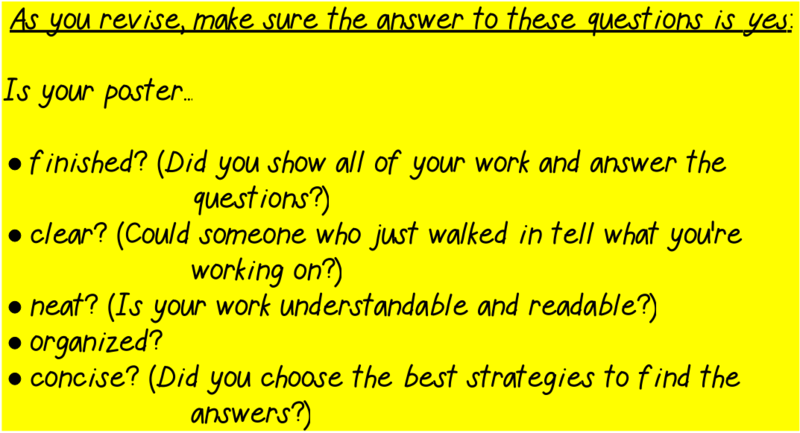 I was impressed with how questions were used and kids were specific with what parts didn’t make sense or that they thought others could improve upon. We are in the middle of a unit on place value in second grade. The warm-ups this week took on a little bit of a different spin, as a couple of times kiddos were expected to finish up work from the previous day’s Math Workshop. 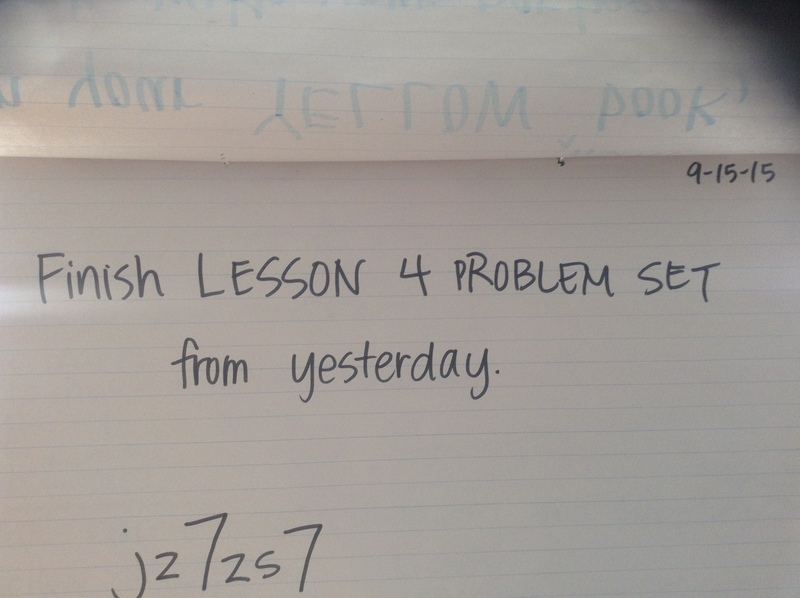 That then became how we started math groups later in the day (I hope that last sentence wasn’t confusing…). 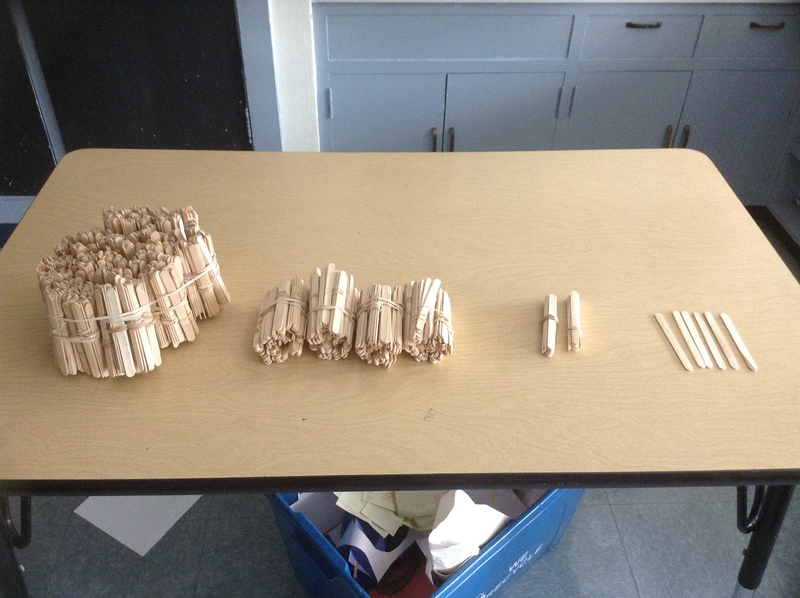 On this day, we were working on modeling numbers in bundles of 100s, 10s and 1s, like we had done during our place value challenge the week before. Pretty exciting question, huh? See the example of what this page looked like below the picture. 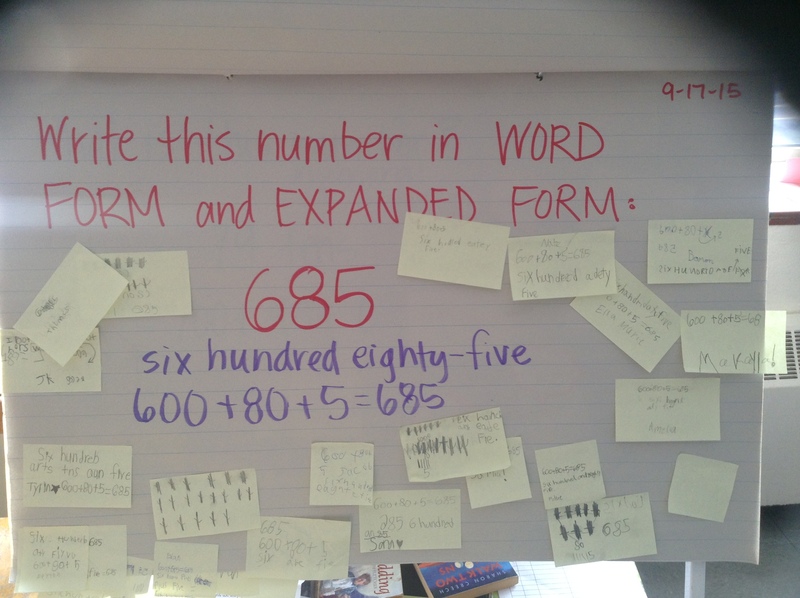 On Tuesday during math we had been focusing on representing a number in many ways, so I gave them a quick one to remind them of word form and expanded form. 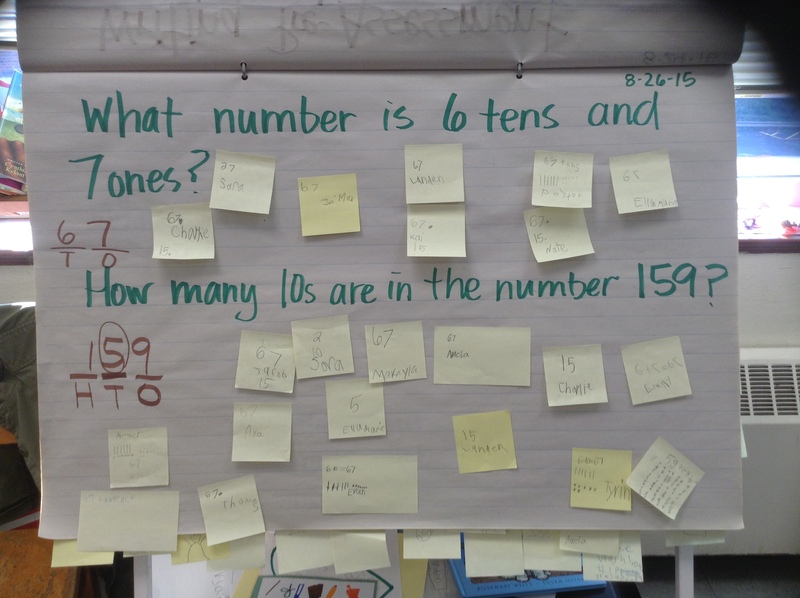 Another one….we also practiced the word numeral for number form, as well as focusing on making sure our numbers go the right way (as we still have some friends who forget. 🙂 ). Even though we worked on this last year, many kiddos had a hard time with the answer to this question. We’ve since been doing many things (games, two-pen tests, conversations) to help us remember (or learn!) our doubles, near doubles and combos of 10. They all form the basis for the bigger things we’ll do with numbers later on. This one was an easy connection to the essential question (EQ) I had asked earlier. 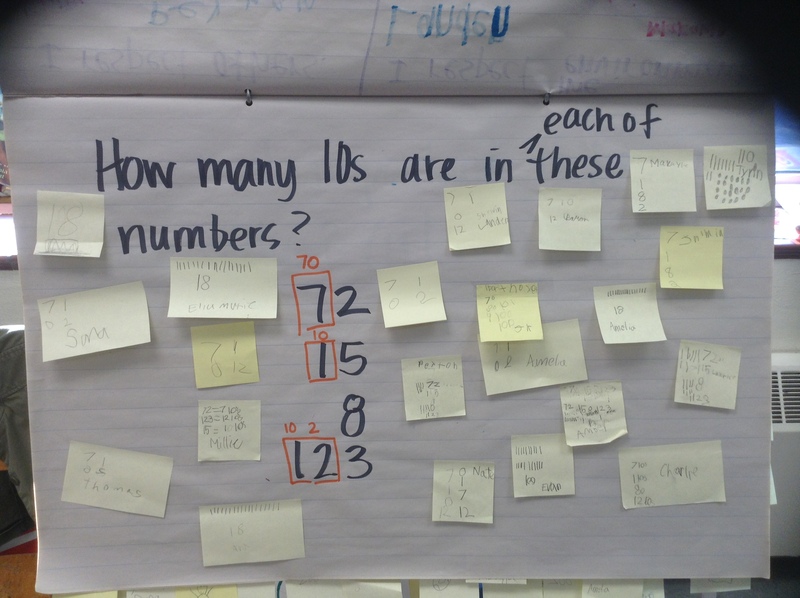 They had to think about place value to answer this one, knowing which numbers to add to each other. 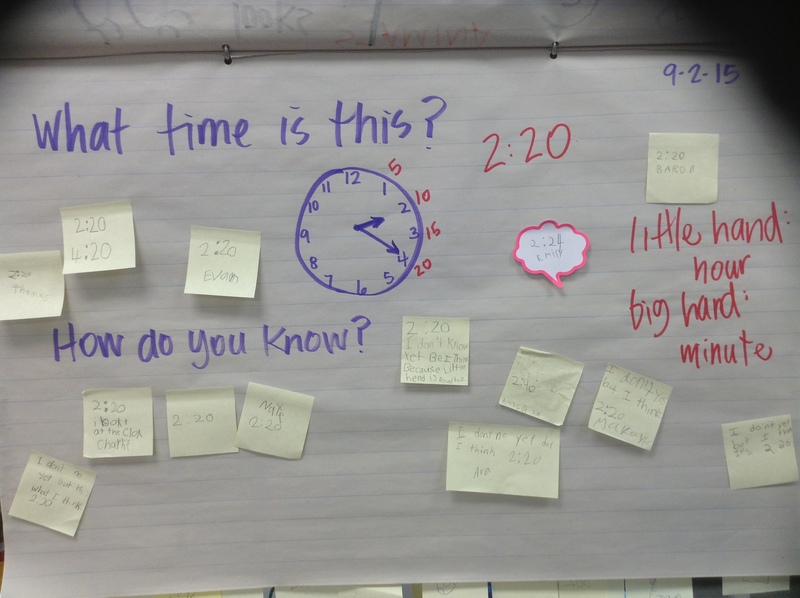 Although not related to place value, this warm-up was related to a conversation we had had in math workshop the day before, and is definitely something all 2nd graders need to know how to do–tell time! Often I will spiral older concepts into math warm-ups to keep them on the front of our minds! 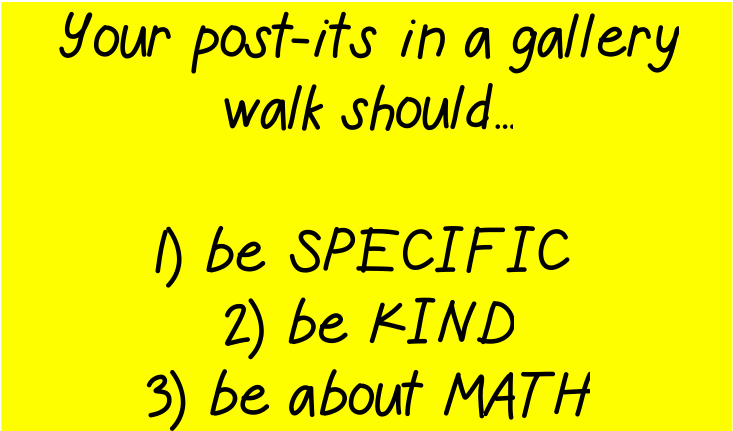 This warm-up, although badly worded, gave kiddos a little peek into a task I would have them do later that day in math workshop. The question was really about the most efficient way to count a big ‘ole stack of something, which they’d have to do with a pile of popsicle sticks in a group that afternoon. I was happy to see how many of them were already thinking about bundling into 10s and 20s (rather than counting them all by 1s). The warm-up on Friday was actually the end of the lesson from Thursday, and mathematicians completed their thinking with their learning partner in their math journal, which is different from how they MWU normally works. I love how we can adapt this structure to work for our needs! Since many of us have been doing this for a whole year now, it was easy to make that little tweak and still have them know what to do. 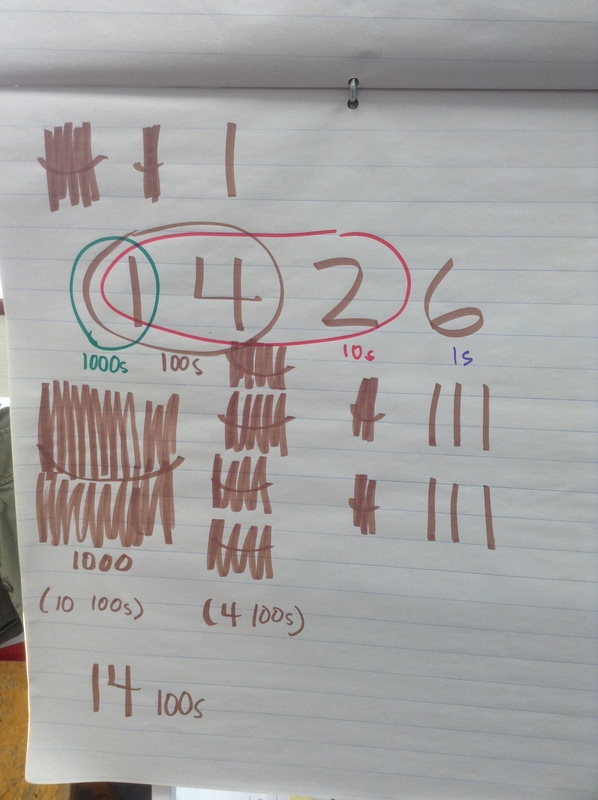 In this warm-up, kiddos were asked to model the counting we had done together the day before.